Bringing together the best from the salon and wellness industry, the event witnessed a successful union of ideas and knowledge. 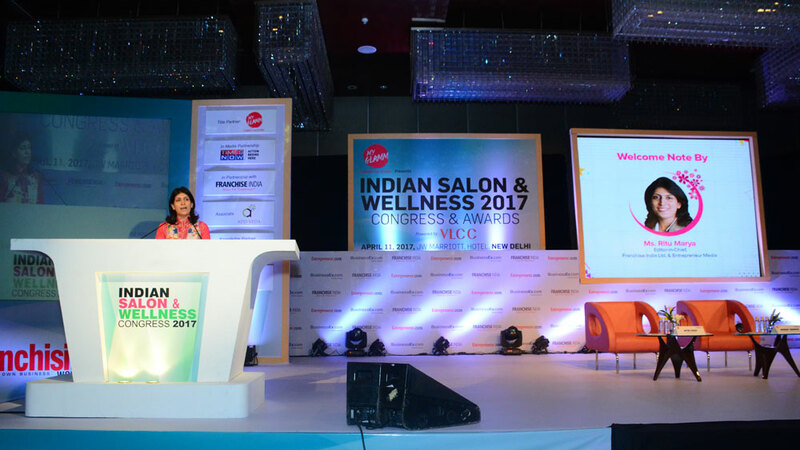 The sixth edition of Indian Salon and Wellness Congress 2017 recently concluded on 11th April, 2017 at JW Marriott, New Delhi, Aero city. The event was organised by Franchise India in association with My Glamm, powered by VLCC and in media partnership with Times Now. The grand event saw several successful entrepreneurs and big names from the wellness industry attending and sharing their thoughts and insights on important topics related to salon and wellness. The inaugural session focused on where we are and where we can reach in the growing wellness industry in India. The inaugural session was addressed by Mr. Nitin Passi, Director, Lotus Herbals Pvt. Ltd and Mr. Anurag Sharma, Managing Director, Shree Baidyanath Ayurved Bhawan Pvt. Ltd. The session had both the speakers giving their respective views about the wellness industry, where they see it now and what the future holds. Other major topics on which they spoke included globalisation of the beauty industry, promoting the industry through Make in India initiative, taking beauty and wellness to the next level and addressing the skills gap to ensure availability of well-trained staff. The session was moderated by Mr. Anurag Mathur, Partner- Consumer Goods and Retail, PwC India and Mr. Nitin Kalwani, Managing Director, Juice Saloon, India; Mr. Mridumesh Rai, Business Director, Park Avenue and Mr. Pushkaraj Shenai, Chief Executive Officer, Lakme Lever India Ltd. were the speakers. They discussed the changing wellness and salon market at length. Mr. Nitin Kalwani and Mr. Pushkaraj Shenai discussed and agreed on how the Indian customers are ready to spend more and more money on themselves at salons and spas’, considering it ensures a wonderful and satisfying experience. Mr. Mridumesh Rai stated that men now are getting conscious about their looks and are spending time and money on themselves in order to match up with the need of the hour. Ongoing further with the topic of men’s grooming, he said that fashion and looking good always work together and people have figured this out as they are investing time and resources to have the perfect look to wear every day. They further discussed new product categories which millennial are accepting in their lives in order to achieve instant results. The session had Mr. Ankush Passi, Founder and CEO, ADDVEDA; Mr. Swagat Sarangi, co-founder, Smytten and Mr. Rohan Vyavaharkar, Deputy Managing Director, Stepathlon Lifestyle Ltd., highlighting on topics ‘ The surging demand of Ayurveda in India and abroad’ and ‘Markettech- mixing beauty, fitness and wellness with innovation’. The session discussed further on India as the cost conscious country and how to give the best to the market involving less cost. The speakers shared their viewpoints and kept forward different version of their thoughts regarding the current game plan in the wellness industry.India is still far away from being a luxury market and is a value conscious country. Cost cutting is important as the market demands the best in less. Fashion and looking good go hand in hand and e-commerce has helped a lot in reaching to a larger section of the market. Social media has been a boon to the wellness industry but reaching out to customers through it is a little tough as the competition is high.The use of various services made available to the customers in the form of applications has changed the game plan of wellness industry. E-commerce has become a potent force and is shaping the future of the industry. Customers expect a personal touch to their experiences and salon and wellness can provide the same to them. The next session had Mr. Vishal Sharma, Managing Director, Everstone Capital Advisors Pvt. Ltd., sharing his insights on what the investment sector wants the beauty and wellness industry to know. He discussed the evolution and growth of the beauty industry and the road ahead. He also shared his thoughts on the business model to scale up and grow in the industry. Mr. Vishal emphasised on the importance of content creation in the beauty industry and the results it has given globally. He also said that web content is liked by everyone as it provides small but important doses of information and consumes less time. Content creation is needed in the industry to boost up information dissemination around the world. The session was moderated by Mr. Rajat Wahi, Partner and Head- Consumer, Retail and Agri Sector, KPMG India and had Dr. Apoorv Shah, Owner, Richfeel Trichology Centre; Mr. Vishal Mehra, Executive Director and Chief Development Officer, Spa L’Occitane, Spa by Clarins, Warren Tricomi, Elle Spas and salons, Holyfield gyms; Dr. Sam Paul, Director and Legal Head, Paulson's Beauty and Fashion Pvt. Ltd and Pauls System Technologies Pvt. Ltd. and Ms. Manisha Chopra, Managing Director, Seasoul Cosmeceuticals Pvt. Ltd. The session focused on a complete look into the market of beauty and aesthetics. “The demands of the customers are increasing and we need to address it. The investors, on the other hand, want good business model” said Mr. Vishal Mehra. The customer expectation is increasing and are needed to be put first in order to establish a great market. According to Dr. Apoorv Shah, the business needs to have something extra in order to stand out in a group of top achievers. There should be something different in the technology used, men behind the machines etc to deserve the best and give the same to the market. He also said that India is a price conscious country. One needs to have the business module correct in order to make things work well. Ms. Manisha Chopra emphasised on the need to go green and choose only natural products. She stated that going green is what is important and passing the messages is very much needed. Indian market is behind other markets in going green. Anything is being sold in the name of Ayurveda. Mr. Sam Paul said that it is very important to grow your business as you grow. The numbers of salons should increase as you go further on the path. Mr. Vishal gave his views by saying that people pay for better experiences. The packages are high and they don’t mind spending money on getting a haircut from an Italian stylist as long as it satisfies their needs. To be profitable is tough, but other views should also be given importance to build a firm ground to stand on. Giving his insights on success, Dr. Apoorv Shah said ‘The key to success is having great people, extraordinary innovations and low pricing’. Concluding the session, everyone gave certain pieces of advice as to how to make a salon business work. Trying to keep the staff together, constant innovation and attaching a WOW factor were some ideas which were presented by the speakers. The session started with Mr. Anurag Kedia, Co- Founder and Director, Four Mountains De-stress spas, NuAyurveda Clinic and Four Fountain Labs, moderating it. The speakers were Mr. Trent Anthony Munday, Senior vice President- International, Mandara Spa, Malaysia; Ms. Norliza Othman, President, Association of Malaysian Spas (AMSPA), Malaysia; Dr. Naresh Arora, Founder, Chase Aromatherapy Cosmetics and Dr. Rekha Chaudhari, Managing Director, JCKRC Spa Destination. The topic being emphasised on was how spa and fitness industry is leading the wellness game. Many factors were discussed which were related to the topic and the speakers gave presentations and also their viewpoints about the spa and salon industry. Ms. Norliza said that focusing on various analysis- market, competitor and consumer behaviour are very important as it decides the next steps to be taken. According to Ms. Rekha , the shortage of skill labour is the problem and skill movement is the need of the hour in the beauty industry. Mr. Trent put down the fact that everyone is trying to get into holistic treatment now as it is new and needed in the market and because of this the consumers are getting confused more than ever. India being a cost conscious country, Mr. Naresh stated the fact that if the complete value of the service is given to the customer then the costing of the service or product will suffer and will be minuscule. The speakers gave valid points about other topics also like mobile spa, the changing consumer in the fitness market and redesigning the spa and salon experience by various hotels. The last session had Ms. Ritu Marya, Editor-in –Chief, Franchise India and Entrepreneur media moderating the session. The speakers of the session were Mr. Trent Anthony Munday, Senior vice President- International, Mandara Spa, Malaysia; Ms. Norliza Othman, President, Association of Malaysian Spas (AMSPA), Malaysia and Ms. Sadiya Naseem, founder and CEO, Glam Studios. Franchising in the beauty and wellness market was the topic of discussion. The panel also touched on topics like mastering the SOP’s and leveraging the brand, benefits of acquiring a master franchise in 2017 and role of skilled personnel in the franchising model. According to Ms. Sadiya, conversion franchise is what she favours as it gives a new life to the existing salons and opens possibilities for new ones. She also said that they develop SOPs and take a lot of help from technology as well whereas Ms. Norliza said that one should go for franchising in order to have a great team to work with. Mr. Trent took it further by saying that customisation is the core difference between all the spas and helps in franchising for the best.